It is clear walking into the Circle in the Square theater where the Tony Award-winning revival of Once on this Island is playing that this is no ordinary show. This is an immersive theater experience like no other currently playing on Broadway thanks to the imaginative vision of director Michael Arden. Set in the round, there are no bad seats in the theater; however, audience members sitting in the first few rows or on the right or left sides of the theater will be most likely to have an opportunity to interact with the actors prior to the show and feel fully immersed in the story. The story is simple, rooted in the lore that myths and legends are made of. One small, insignificant girl, Ti Moune, is spared by the Gods after a hurricane hits her small Caribbean island. She is taken in by two poor villagers, Tonton Julian and Mama Euralie who raise her as their own. After saving the life of a rich boy from the other side of the island, she ventures away from her village to find love. But having promised her soul to one of the Gods, she is forced to make a choice that will forever change her life. With music and lyrics by Lynn Ahrens and Stephen Flaherty, this production is led by original revival cast members Loren Lott (Ti Moune), who stepped in for Tony nominee Hailey Kilgore who is recovering from a foot injury, Darlesia Cearcy (Erzulie) who stepped in for Lea Salonga last month, Merle Dandridge (Papa Ge), who has returned to the production for a limited engagement through August 20th, Quentin Earl Darrington (Agwe), and Alex Newell (Asaka). In his director’s note, Arden writes that he was inspired by not only a visit to Port Au Prince with the creative team, but also by the overwhelming number of natural disasters in recent years, including the hurricanes in New Orleans, Houston, and Puerto Rico, which makes this play seem timely and relevant. 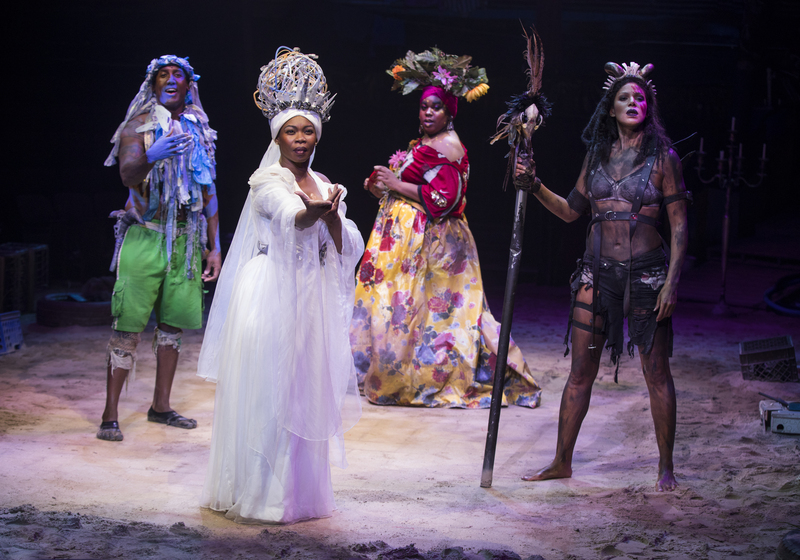 It is also evident that Arden has a personal connection to this piece which gives Once on this Island a heart and soul that not only echoes through the performances on stage, but also resonates throughout the theater and makes this production truly intoxicating. Once on this Island is now playing at Circle in the Square, 1633 Broadway (on 50th), New York, New York. Performance times vary; check the website at Once on this Island. Find more information about current plays in the Chicago area on our Current Shows page and at theatreinchicago.com.